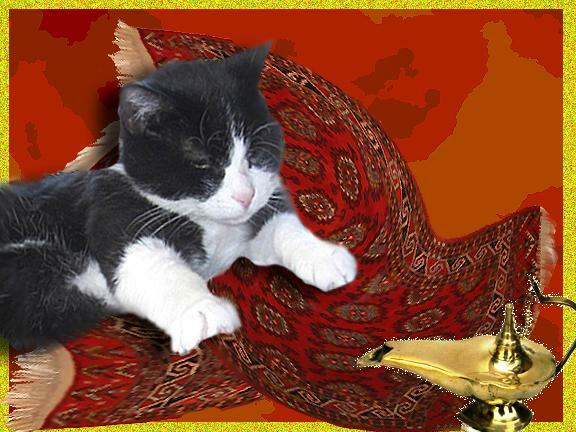 Wendy's 3-D Cats: HAPPY EASTER & HAPPY BIRTHDAY TO MY MILO! HAPPY EASTER & HAPPY BIRTHDAY TO MY MILO! Domino just wants to take a moment to wish all of you a Happy Easter while posing in her Easter basket (her basket chair performs double duty here). Domino is due to take off any minute on her boogie mat to see her true love, Milo. You see, he is celebrating his third birthday today at home in England, and of course, he wanted Domino to be his special guest. 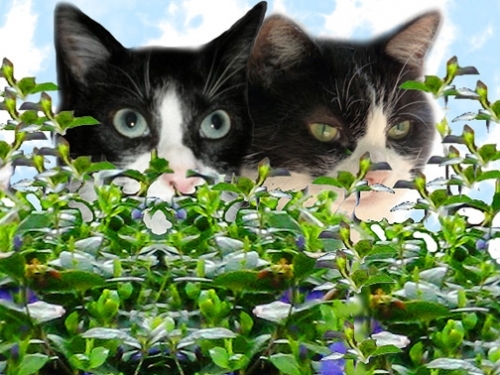 Once Domino arrives, she and Milo are going to sneak off for a PURRivate little rendez-vous! It's a good thing the bushes are blooming in England. 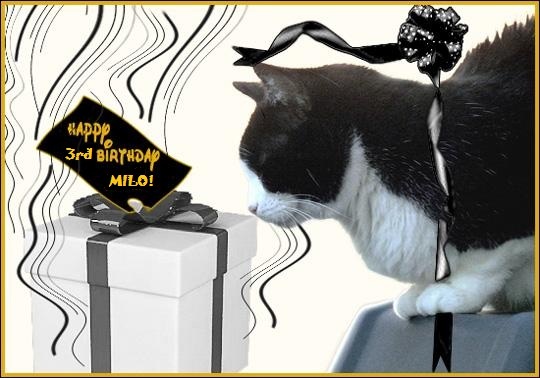 Please stop by Milo's bloggie to wish him a Happy Birthday! We're sure he'd love to see you. hee hee! Snogging in the bushes! We're on our way over to wish Milo many happy returns. Happy Birthday to Milo!!! And Happy Easter to you!!!! I saw you over at Milo's, Domino! I know he is having the best 3rd birthday ever! 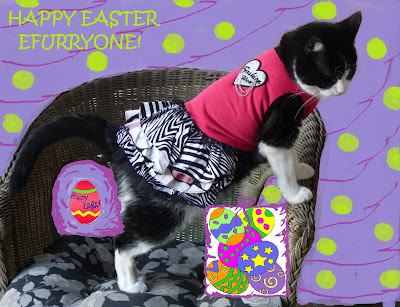 Happy Easter, and Domino, have lots of fun with your sweetie Milo. Just to let yoo know Dommy arrived safely and we are having a great time! Domino, you and Milo are such a handsome couple... what a match! Happy Easter and have a blast celebrating your mancat's birthday! Happy Easter! Domino, I think you are going to make Milo's birthday extra-special! 2 great events in one day! Happy Birthday Milo! Happy Bunny Day to eFURRYone else! 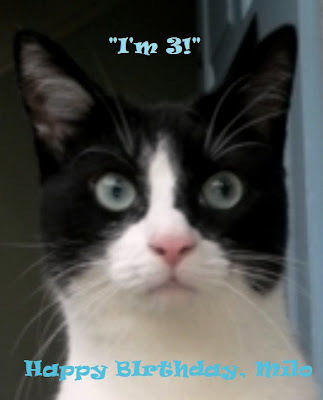 Milo is only 3? Domino U R a Cougar! TUXY TUESDAY WITH DOMINO: THE LION'S SHARE! TUXY TUESDAY WITH DOMINO: SPRING ROLLS! TUXY TUESDAY WITH DOMINO: RIGHT AS RAIN! DOMINO: THE HOSTESS WITH THE MOSTEST!